This section gives an overview of the interactions and behavior of SystemVerilog elements, especially with respect to the scheduling and execution of events. Updates to IEEE STD 1800-20051 divide the SystemVerilog time slot into 17 ordered regions, nine ordered regions for execution of SystemVerilog statements and eight ordered regions for execution of PLI code. The purpose of dividing a time slot into these ordered regions is to provide predictable interactions between the design and testbench code. Every change in state of a net or variable in the system description being simulated is considered an update event. When an update event is executed, all the processes that are sensitive to those events are considered for evaluation known as an evaluation event. Example of processes include, initial, always, always_comb, always_latch, and always_ff procedural blocks, continuous assignments, asynchronous tasks, and procedural assignment statements. A single time slot is divided into multiple regions where events can be scheduled. This event scheduling supports in obtaining a clear and predictable interactions that provide for an ordering of particular types of execution. This allows properties and checkers to sample data when the design under test is in a stable state. Property expressions can be safely evaluated, and testbenches can react to both properties and checkers with zero delay, all in a predictable manner. This same mechanism also allows for non-zero delays in the design, clock propagation, and/or stimulus and response code to be mixed freely and consistently with cycle accurate descriptions. 1. The term simulation time is used to refer to the time value maintained by the simulator to model the actual time it would take for the system description being simulated. 2. 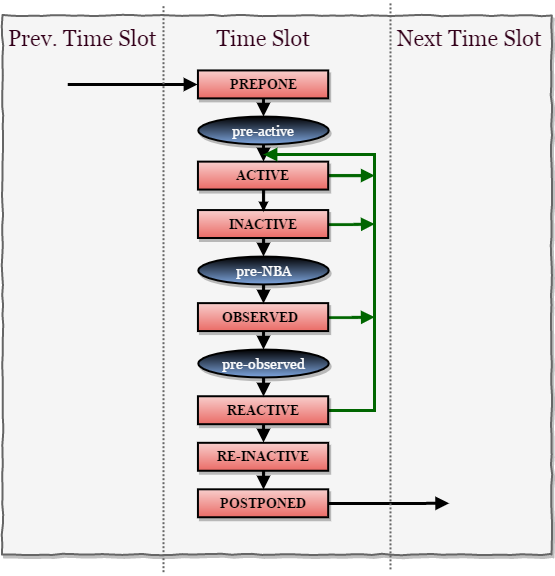 A time slot include all simulation activity that is processed in the event regions for each simulation time SystemVerilog event Regions The new SystemVerilog event regions are developed to support new SystemVerilog constructs and also to prevent race conditions being created between the RTL design and the new verification constructs. The values of variables that are used in concurrent assertions are sampled in Preponed region. (Evaluation is done at observed region). Preponed region is executed only once in each time slot, immediately after advancing simulation time. The Active region holds current events being evaluated and can be processed in any order. Execute all module blocking assignments. Evaluate the Right-Hand-Side (RHS) of all nonblocking assignments and schedule updates into the NBA region. Evaluate inputs and update outputs of Verilog primitives. Execute the $display and $finish commands. The Inactive region holds the events to be evaluated after all the active events are processed. In this region #0 blocking assignments are scheduled. The principal function of this region is to execute the updates to the Left-Hand-Side (LHS) variables that were scheduled in the Active region for all currently executing nonblocking assignments. The principal function of this region is to evaluate the concurrent assertions using the values sampled in the Preponed region. A criterion behind this decision is that the property evaluations must only occur once in any clock triggering time slot. During the property evaluation, pass/fail code shall be scheduled in the Reactive region of the current time slot. The Post-observed region is specifically for a PLI callback control point that allows for user code to read values after properties are evaluated (in Observed or earlier region). Execute all program blocking assignments. Execute the pass/fail code from concurrent assertions. In this region #0 blocking assignments in a program process are scheduled. The principal function of this region is to execute the $strobe and $monitor commands that will show the final updated values for the current time slot. This region is also used to collect functional coverage for items that use strobe sampling.